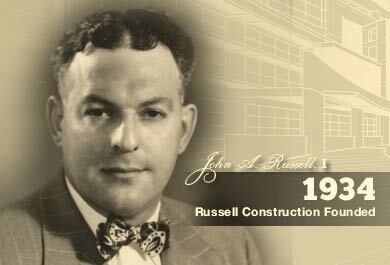 1934Russell Construction Founded by John A. Russell Sr.
1947John A. Russell Corporation formed. 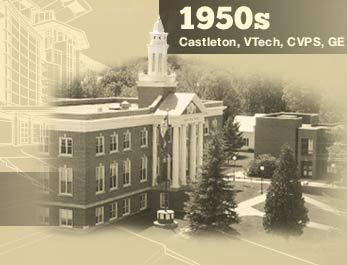 1950sThroughout the 60s, Russell builds projects at Castleton College, General Electric, Central Vermont Power Service, VTech and many churches throughout the Rutland area. 1976 John A. Russell Jr. takes over management of the company from his father. 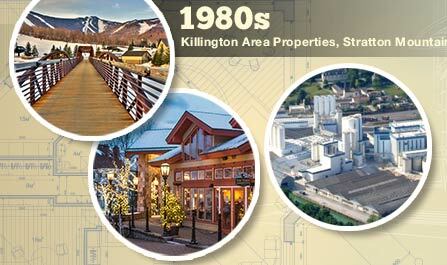 1980s Russell Construction builds and expands many hotel and resort properties in the developing Killington Resort area, Holiday Inn, Comfort Inn, Stratton Mountain and a large expansion at Vermont Marble (now OMYA). 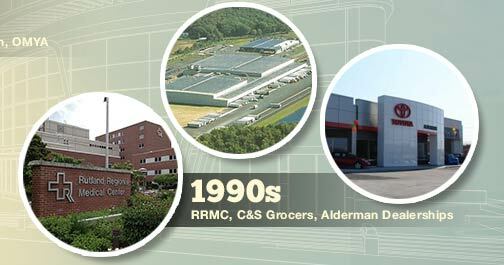 1990s Tremendous growth comes from building power generation facilities, renovating and building additions to Rutland Regional Medical Center, C&S Wholesale Grocers, Alderman Dealerships. 2000s The growth in demand for independent and assisted living facilities, and condominiums brings new emphasis on residential building of many types. 2001 John A. Russell III takes over from his father. 2002 Russell Construction Services is formed to illustrate the wider variety of restoration, renovation, construction management and general contracting services offered. 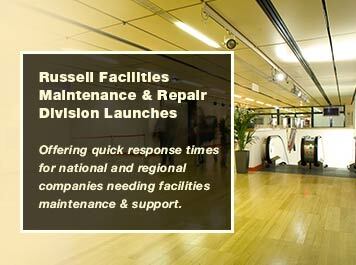 2005 Company launches Russell Facilities Maintenance and Repair Division in response to high demand for services beyond the scope of many facilities managers and satisfying the need for local, quick response time for national and regional companies. In 1934 John A. Russell Sr. founded his construction business by building a simple set of steps. With painstaking precision, he measured three times and cut once, taking care to do the job right to the best of his ability. When completed, he was proud to stand and deliver what he had built; the most solid, perfectly proportional set of stairs ever built! Our founder knew good reputations were built by doing a good job, but extraordinary reputations were built by delivering only the best, highest quality products to customers that come back again and again. He delivered to those customers with every project he built, hence “Doing Things Right” became the mission of the John A. Russell Corporation. John applied this philosophy to every project since, and saw his small business grow to include new commercial construction, restoration and renovation work. He built several projects for then-thriving Vermont Marble, CVPS and Green Mountain College. Forty years later, in 1974 John A. Russell Jr. became the owner and president of Russell Corporation. By continuing to live up to the company’s mission, he grew the business into one of the largest construction firms in the Northeast. John Jr. also expanded the offering of services to include construction management, design/build and industrial services. Twenty-seven years later in 2001 John A. Russell III assumed leadership of the company. He had been working in various positions for seventeen years in order to learn the business from the ground up. With John III at the helm, we experienced a new era of new growth with the same legacy of commmitment to customer relationships. The Russell family of companies has since grown to include Russell Industrial Services and Russell Construction Services. The same determination, skill and commitment that launched the company over eight decades ago still drives us today. In keeping with our simple, yet powerful guiding philosophy, John III carries on his grandfather’s and father’s mission of “Doing Things Right.” Today he ensures quality, integrity and reliability are the cornerstones of every project, and he settles for nothing less. Since our founding by my grandfather in 1934, Russell Construction Services of Rutland Vermont has built a remarkable history of building, restoration and renovation in Vermont and surrounding areas. We provide general construction, design/build, construction management and facilities maintenance services. Our company has an unflinching commitment to provide exemplary quality and service, and we empower every member of our team to live up to our mission of “doing things right.” Our commitment to this guiding philosophy has helped keep Russell a leader in the construction industry throughout all of New England. We’d be happy to explore your next construction project with you. Call 802.775.3325 or contact us via the inquiry form for a prompt reply during business hours. In the meantime, take a look through our portfolio of recent projects. You’ll soon understand our commitment to quality while building strong, lasting relationships with our clients.